The Students’ Magazine. Philadelphia: Pennsylvania Institution for the Instruction of the Blind, 1838. 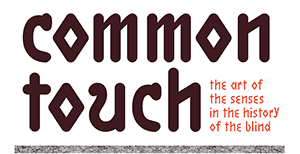 Common Touch is the culmination of nearly five years of work by Teresa Jaynes with the Library’s collections documenting the history of the blind and visually impaired, particularly the Michael Zinman Collection of Printing for the Blind. Jaynes, an installation and book artist, uses literature, visual material, and artifacts to create works with a historical context that are both engaging and thought provoking. Collaboration is also integral to Jaynes’s creative process. Working with her Vision Council, advisors who have experienced varying degrees of vision loss at different stages of life, Jaynes incorporates their professional and personal experiences into the design and concepts of the exhibition to make it accessible to wide audiences, including people who are visually impaired. Leaders in the fields of disability arts and culture and disability studies, as well as advocacy and outreach organizations for people with disabilities, also provided guidance during the exhibition process. Jaynes previously used the Library’s printing for the blind holdings in her installation The Moon Reader on view at the Library in fall 2014. 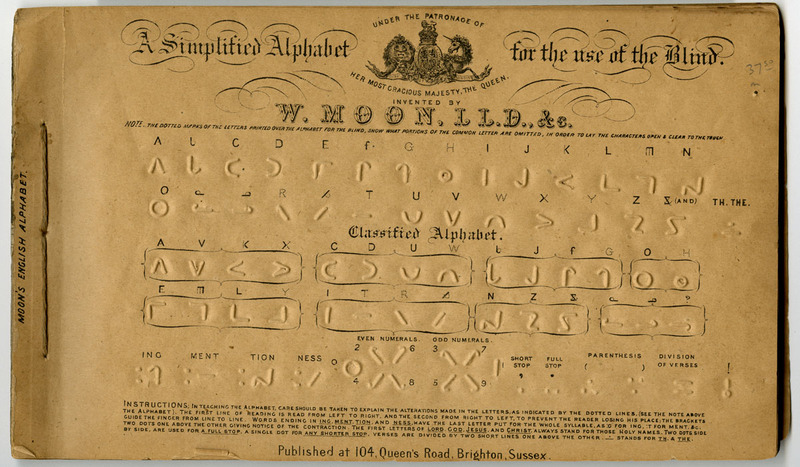 Printed in several styles, including Boston line, Moon type, and Braille, the raised-printing, with a rich and complex history, is striking in aesthetics and cultural meaning. French linguist and educator Valentin Haüy (1745-1822) developed the first successfully printed works to be read with the fingers a year before he established the first school for the blind in Paris in 1785. 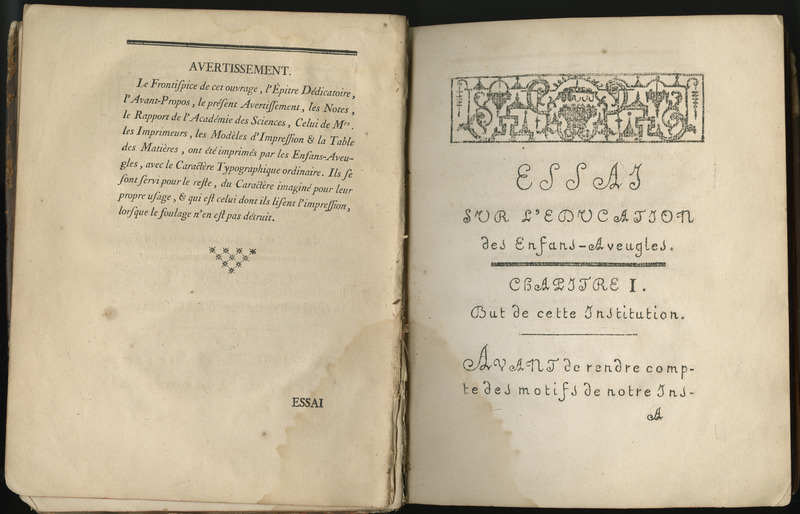 Cognizant of the centrality of reading in education, Haüy devised the embossing type in 1784. 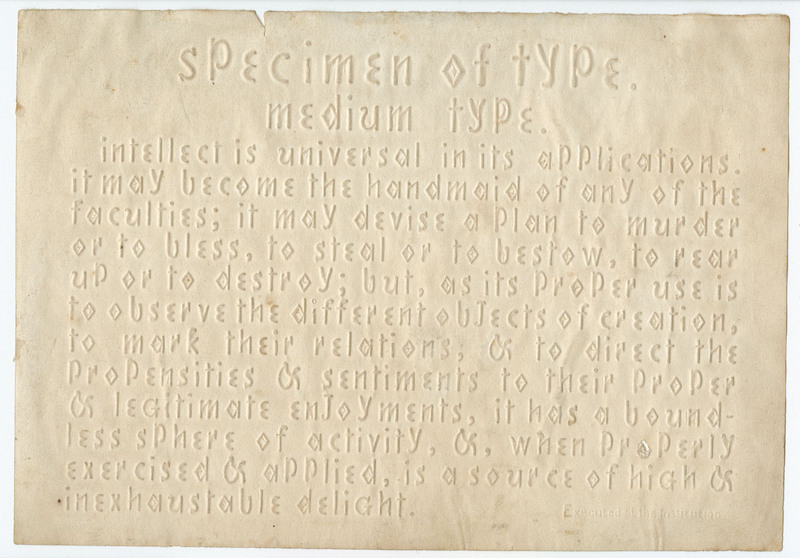 Resembling rounded hand writing, and intended to be read by people who were blind, as well as the sighted, the type was only an early step in facilitating reading through touch. In the ensuing decades, several, usually sighted, developers, took on the quest to perfect a raised method of printing that was efficient in production, easily and coherently read with the fingers, and universally adoptable. The raised-dot systems Braille and New York Point superseded line types, such as Haüy’s, and predominated in the United States by the later 19th century. By the early 20th century proponents of both styles advocated for the universal adoption of a single reading code. In 1932 the “war of the dots” came to a conclusion with the acceptance by authorities of Standard English Braille as the uniform type for the blind in the United States. 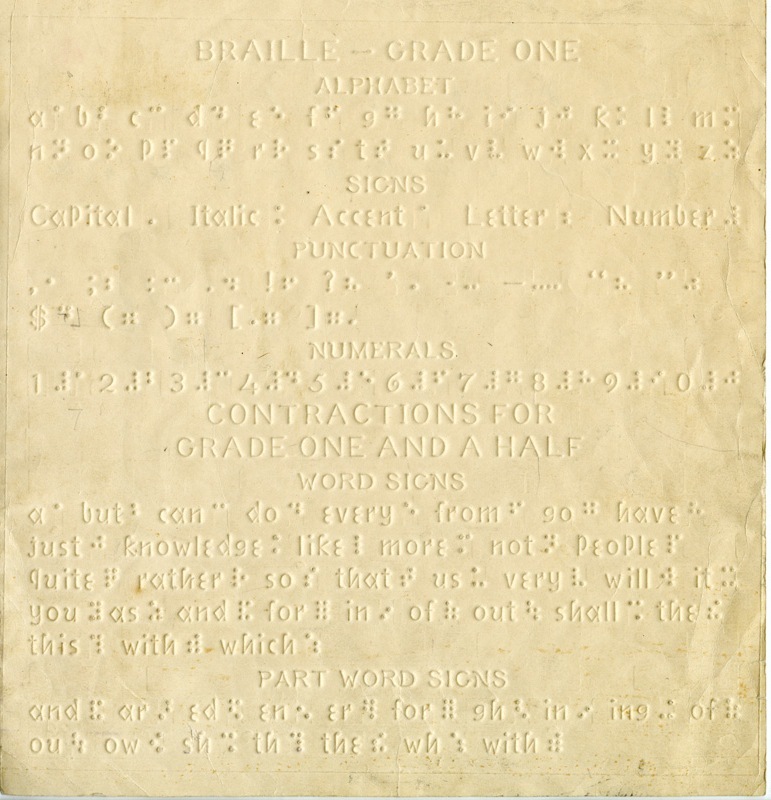 Historical printed materials for the blind, including texts, maps, and diagrams, are not the only holdings related to the history of the education and visual culture of the blind and visually impaired in the Library’s collections. Nineteenth-century personal narratives and textbooks, as well as reports, pamphlets, and magazines issued by educational institutes, such as the Pennsylvania Institution for the Instruction of the Blind, also made up the holdings so important to the conceptualization of the themes of Common Touch. 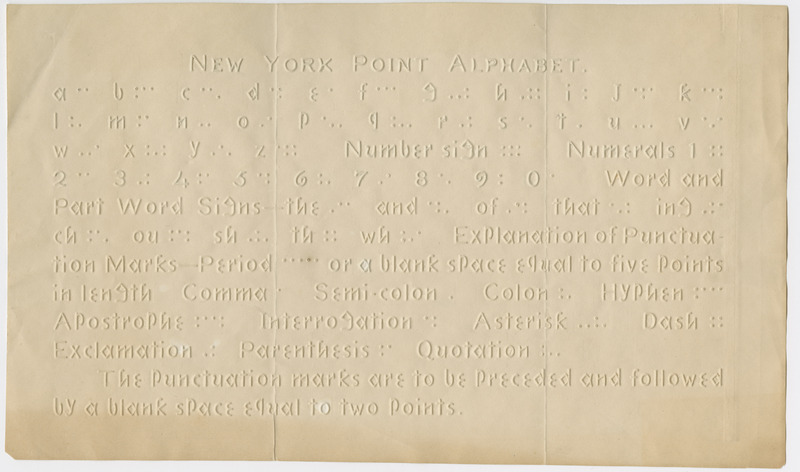 Elizabeth M. Harris, “Inventing Printing for the Blind.” Printing History 8 (1986), 15-25.